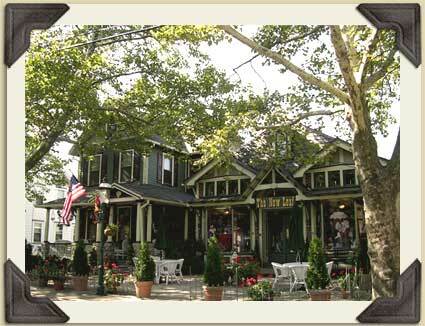 The New Leaf Tea Room and Gift Shoppe is located at 606 Main Street in the Victorian village of Riverton, New Jersey (listed on the National Register of Historic Places). Nestled within the heart of the quaint downtown, it is conveniently located off major highways and is just a short stroll from the scenic Delaware River. Here The New Leaf has thrived for over 30 years and plays an active role in community events. The New Leaf is housed within a lovingly restored 1910 Victorian storefront and adjacent 1898 house. Here you are offered the exquisite pleasure of experiencing formal afternoon tea in an elegant yet relaxed setting. Ranked a top NJ Tea Room by TeaMap.com, the charming Victorian parlours bedecked in crystal chandeliers, oriental carpets & rich tapestries are perfect for celebrating any special occasion such as bridal or baby showers, office parties, bridal luncheons, fundraisers, Red Hat gatherings, anniversaries, family reunions, birthdays, and children's parties, and i it s perfect for a few friends to enjoy each others company. The New Leaf Tea Room offers themed teas with entertaining musical, historical and theatrical presentations. Our sumptuous Tea offers our famous freshly baked scone, seasonal fruit, assorted tea sandwiches, decadent desserts, and pot of tea. For an extraordinary dining experience, a visit to The New Leaf Team Room is a must! For over 30 years, The New Leaf Gift Shoppe has featured an unusual and unique array of distinctive gift items, home decor, gourmet specialties, personal indulgences, gift certificates, loose leaf teas & tea accouterments. A visit to our tea room and gift shoppe will soothe and comfort your spirit as you partake in the refinement of sipping tea, savoring delectable treats & browsing through our gift shoppe. If we can assist you with any further questions we are only a phone call away! 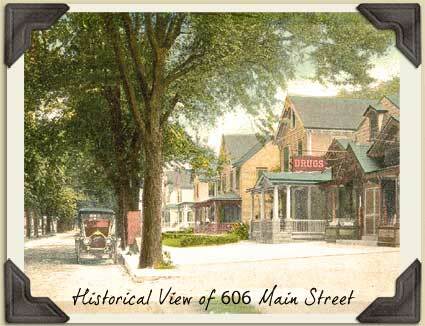 Located at 606 & 608 Main Street in Riverton, Ezra Perkins erected the house in 1889 and then built a small building on the right side as a butcher shop, circa 1900. The property was sold to a prosperous Riverton pharmacist, William Stiles, who had his own drug store at 526 Main Street. He razed the butcher shop and erected a "thoroughly modern drug store and soda water fountain", which opened in April 1910. The drug store not only had patent medicines, but also a small lending library where, for a cent a day, one could rent a book to read. The soda fountain was popular, and various toiletries were also part of the regular stock. William Stiles and his wife lived in the house at 608 Main Street until they built a new home on the corner of Thomas and Midway. Stiles owned the store until 1936, when he sold the business. In the 1940's, the residence and drug store were purchased by Freeman Hunter, who operated a fine furniture store for over 30 years. In 1979, this site became the home of the current gift shop. The property was purchased in 2003 by the Rodgers family, lifelong residents of this area. The buildings have retained many of their vintage characteristics, such as: the original, ornately embossed 15 foot tin ceiling; apothecary shelves; showcase windows; pocket doors; and arches, corbels, and moldings. The two structures are connected by an enclosed walkway that was originally used when the druggist was called for at night. The passageway now serves as an entrance to the formal Victorian tea room, which occupies the first floor of the 1889 house.